Misonikomi udon is a regional specialty dish from Aichi prefecture and it is made with hatcho miso (or any red miso). The company I work for imports and distributes miso from the oldest hatcho miso producers in Japan- Maruya. They were established in 1337 and even today they use wooden barrels to make their miso. 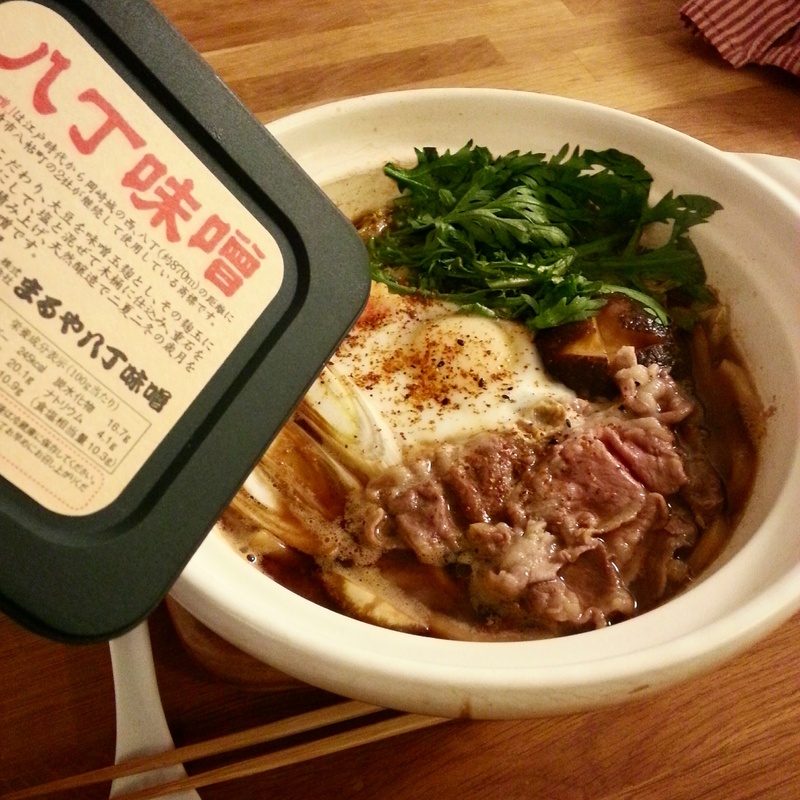 Hatcho miso is made with 100% soy beans, so it has even more umami than other misos. They have to use more salt to ferment the soy beans, but hatcho miso actually has less sodium than other misos. Hatcho miso is a very dense miso that has a distinctively pungent characteristic to it. I have actually never had Misonikomi udon (which literally means “braised in miso udon”) before but I started craving it after I met the president of Maruya and he told me about hatcho miso. Misonikomi udon is nearly easy as making miso soup. Simmer the dashi and add the negi and shiitake. Add the hatcho miso (since it’s very dense make sure that it dissolves fully). Crack the egg into the soup and let it poach slowly. Meanwhile, cook the udon (if it’s fresh it will take a much longer time so think about the timing). When the egg white nearly settles, add the shungiku, narutomaki and pork belly. 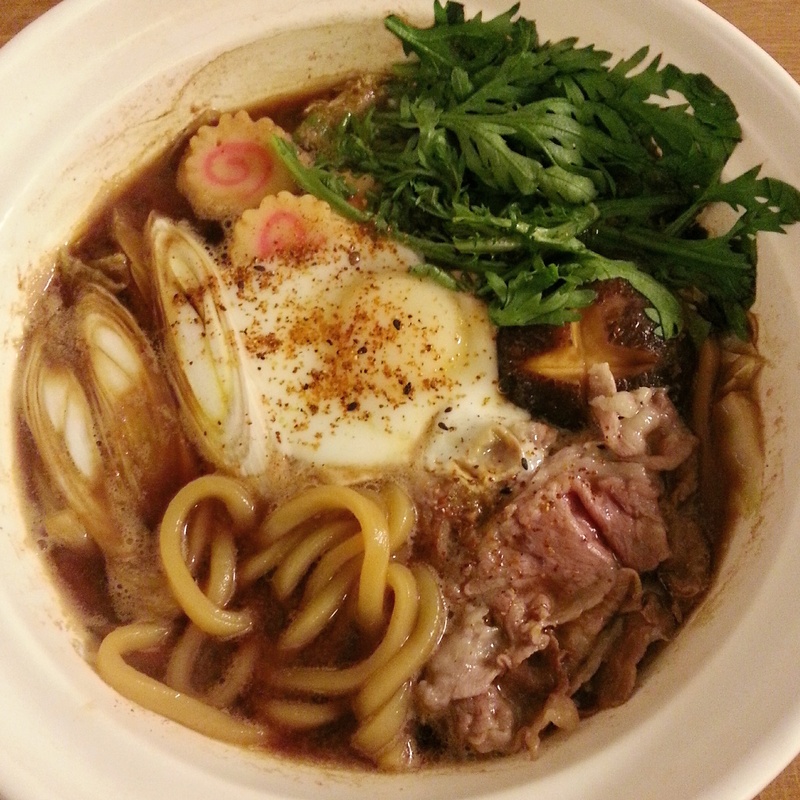 Once the pork belly cooks through, ladle the soup over the cooked udon.